Just want to share this latest interview of Kim Hyun Joong.. Feels like you’ll know him a little through this interview.. he was very candid and honest in all his answers.. Thank you muish for translating and sharing this interview!!! SS501’s leader Kim Hyunjoong ran panting into the pojangmacha (roadside stalls where they sell side dishes and alcohol), 30 minutes late and said “Can you smell the burnt tire?” before I could scold him. After performing at the Hallyu festival at Chamsil, the time Kim Hyunjoong came to the Kangnamgu Shinsadon pojangmacha was 11 PM. “Olympic road had an accident so I came with the emergency lights on,” he said. And then he ordered seasoned butterfish as side dish, saying “I got to eat a few pieces of chicken in the waiting room but I’m really hungry.” He said, “Soju is getting less and less alcoholic so nowadays I can’t get drunk with even five bottles,” and smiled. I didn’t have to worry that he would answer with single word answers or worry only about his image. This talk over alcohol with Kim Hyunjoong proved wrong the prejudices about idols. — Can you really drink five bottles of soju? “Sometimes I drink more when I’m feeling well. (laughs) But nowadays, I’m unhappy that the soju has decreased to 19% alcohol. Since it’s gotten weaker, even women are able to drink 1-2 bottles without a problem. This must be a marketing strategy by the Soju company to increase the sales. I miss the days of Dukkubi Jinro Soju with 25% alcohol. — When did you start drinking? “In first year of High school (about grade 10), I worked at the TGI Friday and the sunbaes who worked there ate out together after work often. There’s a lot of stress in working in the service industry. The hyungs in their 30’s would say “Today, we’re the king,” and de-stressed with alcohol. I worked there for 1 1/2 years and I still keep in contact with a few of the hyungs often. — If you worked in a restaurant with that appearance, you must have been famous. — Did you have a lot of part time jobs? — What kind of work do your parents do? “They work at the Dongdaemoon Market. They have their days and nights reversed so I almost never get to see them. (laughs) I was a very problem child but now I want to treat them well. — Where do you go to drink often? — You were casted in a drama. Will SS501 start individual work? “Right. Following “We got married,” I am going to be on “Hana Yori Dango” and Jungmin will be on a musical called “Grease.” The other three will perform in a project group. — In the drama, you’ll be the top 0.1% luxurious youth. — A lot of people remember you from “Can you get refills for love?” from debut times. — What will you do if your acting becomes an issue. “I like it now but initially, I thought they meant that I’m like a “dol-I” (retard/crazy person) so I didn’t feel good. I’m interpreting it now as something like “having unique charms.” (laughs) In that way, I think everyone has some tendencies to be 4th dimensional. — Do you have an actor or an actress you like? If you had to name just one? — What do you consider important in daily life? — Who is a friend celebrity that you can call even at 2 AM? “Hero Jaejoong and Micky Yoochun, and TOP. These three are the best friends. When we meet, we don’t let anyone else join us. (laughs) And the friends from Songpagu Chamshil who never left me for 23 years are also my family. Sukchon lake Shinchol eatery street was our stage. I hung out in such a small area that I the first time I had gone out of Seoul outside of my graduation trip was after I became a singer. — I heard you invested in a chicken restaurant with your friends. — What was the most embarrassing thing you had to do recently. — If you could become invisible for one day? “At one point, I wanted to visit the women’s bath house or go to the bank but I’ve changed my mind. What’s so good about going to the bank? They’ll still be able to see the money floating by. Instead of being invisible, I wish I could move really fast. I want to do the schedules quickly so I can get another hour of sleep. — Is it exhausting to live as an idol star in Korea? — Do you ever regret having dropped out? — If you could go back to the Chamshil middle school days, what would you do? “I think I would participate more with the school band “Aksus” (means to scream). When I was fourteen, I went to Nakwon stores to buy base guitar with 70 000 won (about 70 dollars) for the first time. It was actually 80 000 won but the owner saw my stack of 1000 won (~ $1) bills and gave me 10 000 discount. — Were there no support from your parents? “At the time, if you wanted to formally learn music with lessons, it cost about 3 000 000 won (~$3000) a month. My dad was having a hard time with his business so I couldn’t ask him for money. There were times that I despaired that “music is really money.” I remember practicing 8 hours a day until the speakers from the computer broke. — What do you think you would be doing if you weren’t a singer? “I don’t think I can be a salary man so I think I would have part time jobs. I don’t think it’s necessary to have formal work if you live for your own enjoyment. I think the people who work in firms despite complaining do that because they value money more. In a way, you trade time for money. Happiness doesn’t come out of a bank account. Once, I made 100 000 000 won (almost 100 grand) but currently, the balance in my account is 2 600 won. (~ $26 ) But I still don’t think I need anything. “Why would I lie? There was a time I had part time jobs and sold things and made 100 000 000 won. The way to make money? It’s simple. You just have to not spend it. There were times when I worried over 100 won. But now, I eat the meat I like and spend more but whenever I see my friends, it’s still Dutch pay. — What’s the most valuable thing? “My friends. Even if I become penniless, my friends will help me until I can stand on my own. Beautiful women are transient memories but friends are eternal. — What kind of a son are you? “I’m a cold son who doesn’t talk much. I can never say “thank you” or “I love you.” There were times when I got into gang fights and my parents had to get me from the police station. The settlement fee cost them several 10 000 000 won. I really want to do well for my mother who was treated like a criminal because of me. I want to repay them for all the bad things I’ve done. I have one older brother who is currently in them military and he used to do quite well in school. — You get attention wherever you go. How is your satisfaction level? — What’s the scariest thing in your life? — In your opinion, what kind of a person is Kim Hyunjoong? — Is there a reason you came to love comics? — Why didn’t you go home? — How did you come to have your debut? — Did you learn dancing from he beginning? He has two cell phones. One of them has an image of the fans cheering with balloons. The first saved number is his home. The rest is empty. He said he likes to memorize numbers so he remembers the phone numbers of 30 of his friends. -People must be sad when you stop “We Got Married” next month. “I felt happy filming “We Got Married.” Even the Dongdaemoon intestines restaurant ladies call me “Kid groom” and specially give me the side dishes for employees. I can feel the increased popularity. — What kind of a woman are you attracted to in real life? –The last question. What do you want on your tombstone when you die? 1. Hyunjoong dropped out in first year of highschool…but he did go back to school and graduate. This makes the age thing in Korean boybands really confusing. ^^ With DBSK, they cut off who should call whom “hyung” by school grade. Thus, Junsu calles Yunh “hyung” even though they’re born in 1986 because Yunho was born earlier in the year. 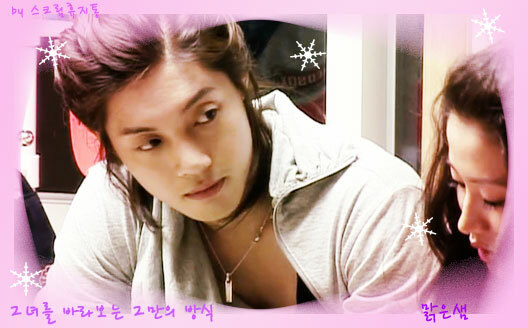 Hankyung was born early 1984 and is considered the same age as Heechul who was born in 1983. In SS501… they go by calendar year because… Hyunjoong gradated with the younger members. ^^ So Kyujong who was born in 1987 calls him hyung even though Kyu graduated a year before hyunjoong did. Very complicated and too confusing.. and I’m not sure what happens when the groups mix. 3. The scar on his face is from his time working in constructions as a teenager. 4. He used to get really good grades… like… top 10 in his school, not just his class. And then he gave it all up for music. But in YSMM, he said love is more important than work and music. So… despite his hard ways, I guess he’s still a hopeless romantic. ^^;;; He had a crush on a girl for like 3 years and then dated her for another 3 years or so, including the time he was working as a singer with the “Warning” song.. and Hwangbo had dated one man for eight years before breaking up with him last year. I really think they’re sooo meant for each other… but that’s probably because I’m a hopeless Joongbo fan. feel free to visit this blog.. anytime..
hope to see you more!! neνеr foսnd any іnteresting article ⅼike yours.